Evaluating organization development (OD) and change is critical for any executive team, project manager, or consultant who wants to see the change effort sustain and successfully evolve. Evaluation can be the key to enacting real change that makes sense to the team, your customers, and your stakeholders while seeing your strategic plan make crucial differences. 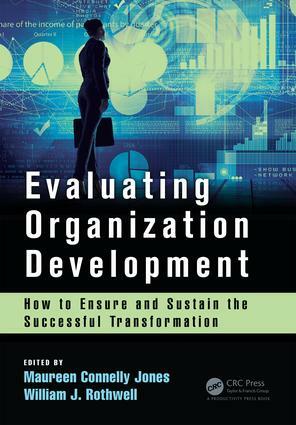 The process of evaluation is often missing from change initiatives, and many previous books have glossed over the topic, but Evaluating Organization Development: How to Ensure and Sustain the Successful Transformation makes planning, implementing, and then assessing your change efforts simple. With handy "how-to" lessons, pull-out tools that are ready to use, and case studies that guide the implementation of each step, your team will be able to show the impact and justify the resources for each project. In addition, your team benefits from this step-by-step guide because they too will now understand their role and be connected to meeting the challenge of each metric. When the team understands the goal and how to achieve it, everyone wins. Why Evaluate Organizational Change Efforts? How Does Organizational Change Evaluation Differ from Training Evaluation?